Something so seemingly routine as downloading video wouldn’t immediately strike you as an area where there’s room left for much innovation. That’s not the case. With literally tens of billions of videos being viewed every month, you know lots and lots of them are being downloaded. That’s created a competitive niche for a video downloader. The result is a wide range of design approaches, differences in ease of use and quality. There are hundreds, maybe thousands of video downloaders available. Many are often referred to as Flash (FLV) or YouTube downloaders. There’s plenty more content online than just YouTube videos for you to explore and download. While there may be a lot of video downloaders readily available, we’re going to compare four free video downloaders: Ant, Freemake, Orbit and RealDownloader. At first glance, this seemed a comparatively straightforward topic. I’m familiar with video file format converters and they are complicated. Converters are the language translators of digital media. Format converters sift through the differences in containers and compression algorithms to enable compatibility among other formats and devices. How complex could it be to download video? More than I imagined, as these video downloader programs had many different features and functionality. For testing, all downloads were done through Metacafe, as they cover a number of content areas, and all of it is free to download. Ant’s approach is to embed its video Downloader activation and control mechanisms directly into a toolbar on your browser. You must do separate downloads and installations for Microsoft’s Internet Explorer (IE) and Mozilla Firefox. Ant does not install on Google Chrome, Opera, or other browsers, so if you prefer using those browsers you’ll need to choose a different free app. The icons within the green line above show the Ant controls that get embedded in IE. Downloads can be initiated by either clicking on Download, or on the green circle with the blue “a” at the bottom of the screen grab above. The red and blue lines with the number 2 next to it takes you to their traffic ranking page, full of all kinds of categories and searches. When on a web page with a video playing, just click either of the two download buttons, and Ant goes into action. It then places the file in a folder you’ve designated. Those files can be viewed by clicking on the Browse button. The Ant Download Manager shows a list of all the video files in your folder, plus progress on any downloads that may be happening simultaneously. 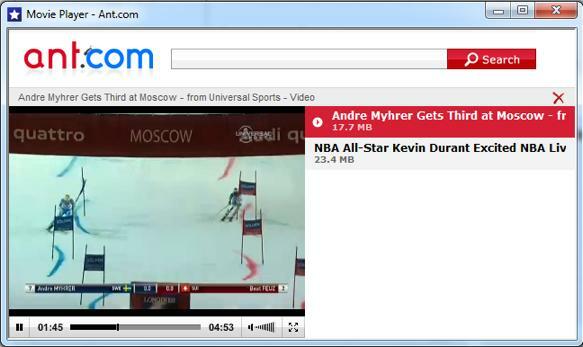 Ant only downloads FLV files and it also has a built-in Flash player where you can view your videos. The window can be expanded to the limits of your screen, but the list of clips will always be present, so you can’t get a true full screen display. All in all, Ant worked well. Embedding the controls in a tool bar on the browser makes for easy access. You can play the files in whatever media player you like by going to the folder holding them, and opening the file with your player of choice. Freemake uses both an old school approach and the embedded method to download video. Like Ant, Freemake plants itself with one button in your Firefox or Chrome web browser. Sorry, Internet Explorer. Freemake installs in both browsers automatically. No need to do separate installs as with Ant. When a video is playing, simply click on the Freemake Download icon on the browser. That opens the program, showing the progress of the clip being downloaded. If you’ve already saved some videos, as I have below, that list will be shown. Clips can also easily be deleted. Freemake does not have a built-in video player like Ant. Clicking on the green triangle play button sends the video to open in your default media player. Interestingly, Freemake also has a built-in format converter. Clicking Download in the window above reveals a drop-down menu with choices for the file format or device you want the video converted to. A nice touch. Remember I mentioned Freemake also uses an old school approach. Well, that is to actually copy the URL address of the clip you’re viewing from the browser by clicking on the Paste URL button in the downloader panel. You’ll need to do this when using Internet Explorer or another browser Freemake doesn’t support. It works fine – just a bit tedious as we’ve come to expect one-click solutions to download videos. Freemake consistently downloaded MP4 videos from Metacafe, but also handles FLV. It’s simple enough to use and got the job done, plus the converter feature is slick. The Orbit downloader tries to be more progressive with its user interface than Ant or Freemake. Part of the program embeds itself in the browser, but only in Internet Explorer. This feature isn’t available in Firefox or Chrome, there is a preferences pane for monitoring those three browsers, plus Opera, Avant, Maxthon, and Custom. Confusing. This program had me going in circles from the start. Interestingly, the Orbit download process actually mimics how RealPlayer’s RealDownloader operates, by activating when placing the cursor within the frame of a playing video. When you do that, the GetIt button pops up, usually near where the cursor is positioned. Just click on the arrow next to GetIt to reveal a drop-down menu. I remember from the installation that I was prompted to also install GrabPro. So I click on the With GrabPro option. 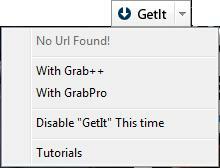 I certainly didn’t want to Disable GetIt This time, and I don’t know what Grab++ is. Nothing seems to be happening. No window opening showing the name of a video clip, or a progress bar indicating a download is taking place. Instead there is a yellow box on the right with the icons and the number 3. Clicking on it looks like there is at least the potential for downloading by clicking on Download it (in blue on the right). The process starts and the video clip is downloaded and placed in the Orbit folder I’ve created. Success, but with more effort than expected for what should be a simple download. It works; it’s just that the user interface isn’t exactly intuitive. GrabPro works well enough. Orbit supports several video file formats: FLV, AVI, MPG, MPEG, QT, ASF, MOV, WMV, RM and WEBM. The confusion factor is high and it lacks a built-in video player. Notice the icons for Facebook, Twitter, MySpace and Email. Each of the videos in the list can be shared directly from RealDownloader to a social media site. RealDownloader even has a built-in player so you can watch the videos you’ve downloaded without having separate player software installed. RealDownloader supports several video file formats: FLV, MP4, ACC, MPEG4, H.264, MOV, RV, and RM. Which Video Downloader Is Right For You? As with all product comparisons, each application has its strong and weak points. Downloading video from the Internet should be a straightforward, simple process. This isn’t a complex technical challenge. Ant works fine through its embedded buttons in the browser. However, it’s limited to downloading FLV, but does have a built-in FLV player. Freemake also embeds its download button, and shares a similar download progress and clip list window with Ant and RealDownloader. Freemake can also copy and paste URL addresses if necessary. It’s format conversion capability is especially convenient. Orbit was far and away the most complicated and troublesome. It tries to mimic the “Download This Video” technique used by RealDownloader with its “GetIt” button, but adds layers of additional menus, windows and download buttons, muddying the process. I’m imaging you’re thinking something like, ‘Of course this guy is applauding RealDownloader.’ Don’t’ take my word for it. Do the comparisons for yourself. All these downloaders are free. Run your own tests and see which you like best. Read more of Tom Volotta’s work on the RealPlayer blog.